The principals of Watercrest Senior Living Group, Marc Vorkapich, CEO and Joan Williams, CFO, joined partners, Jeff Carmichael of RockBridge Senior Living Communities and Brian Su, of Artisan Business Group, at the Invest in America 2013 Summit & Exhibition in Shanghai, China to present investment opportunities in senior living in the United States. As guest speaker, Marc Vorkapich, CEO of Watercrest Senior Living Group, presented the crowd of global investors and business executives compelling opportunities for investment in projects in the EB5 program. EB5 attracts foreign capital for funding projects, such as senior living, while creating new jobs in the United States. Vorkapich and Williams are proven industry leaders and nationally recognized for their achievements in assisted living, memory care, independent living and skilled nursing operations. 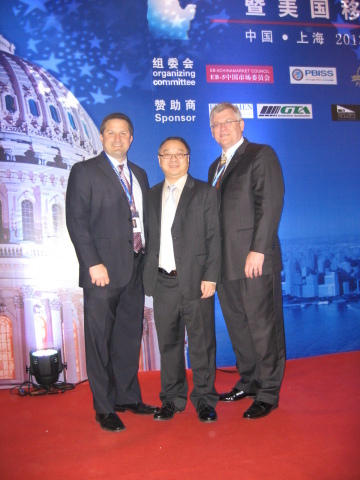 Brian Su, of Artisan Business Group, Inc., an Illinois-based US-China cross border investment and business advisory firm, hosted the Invest in America 2013 (Shanghai) Summit & Exhibition – Immigration and Investment Opportunities, which is the 3rd annual USA-themed investment conference in China. With instant access to major Chinese media and nationwide business networks, the 4-day event included 66 exhibition booths and 20 breakout sessions of U.S. EB-5 regional centers, investment project developers, real estate brokerage firms, franchises, private equity and venture capital companies, financial services, attorneys, CPA’s, international trade agencies, government officials and colleges. The event, held in conjunction with the Shanghai Property Trade Show, attracted over 10,000 investors and business executives. Watercrest Senior Living Group specializes in assisted living and memory care community operations, market repositioning and advisory services. Partnering with a wide variety of stakeholders such as land owners, real estate developers, investors, financial institutions, and REITs, Watercrest Senior Living Group focuses on its core strengths, operations management of assisted living and memory care communities and the development of servant leaders.